As you probably know, we are coming up on a HUGE milestone. Henry, Jack, and Sophie will be ONE in less than a week. I anticipate that I will be reminiscing an awful lot in the next few days, and I’m not sure I’ll have time to blog about it all, but I’m going to start now to see how much ground I can cover. There is a lot to say about this past year! 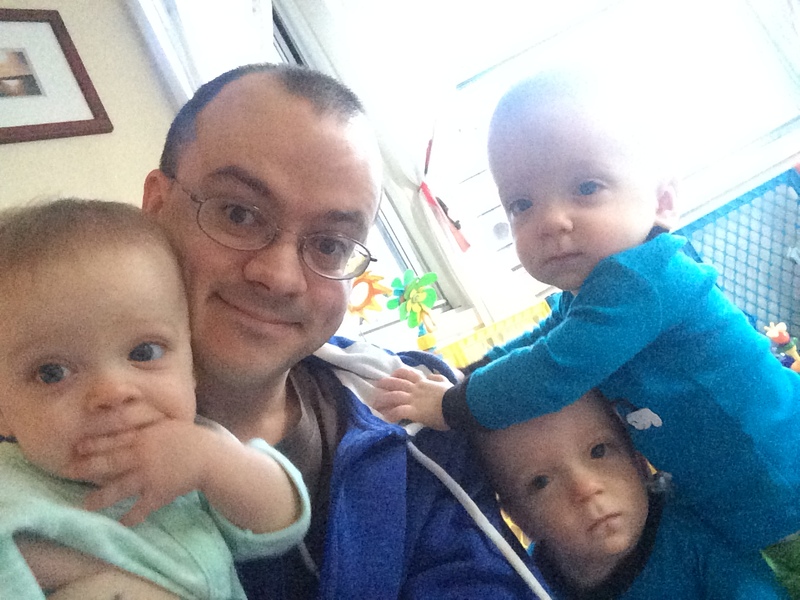 I didn’t actually start this blog until a few days after the triplets were born. It never occurred to me to blog about my triplet pregnancy (although I spent hours pouring over other triplet mommas’ blogs as I prepared to welcome these three little people into the world). In fact, it never occurred to me to blog at all. It wasn’t until I was talking to a friend about how difficult it was being home without our trio, and she suggested I blog about it. So you can all thank Emily for sending me down the road into bloggerhood. I know I do! In the days after the babies were born, it was still too hard to talk about the days leading up to their delivery. Many of you know a good deal about my journey to motherhood because you are close friends and family. But in case there is anyone out there reading (like I was) as a triplet mom-to-be, or anyone who, like me, had a somewhat traumatic start to motherhood, or anyone whose birth story simply didn’t go according to plan, I am going to share the story of how Jack, Henry, and Sophie arrived. Exactly one year ago today, at about this time, I was 27 weeks and 1 day pregnant with Henry Samson, Jack Waldron, and Sophie Ann. And yes, we already had their names picked out. I had read every twin/triplet/pregnancy/baby book I could find. We had moved into a new apartment, closer to work, twice as big, and replete with an elevator. AND a dishwasher. Walls were painted, boxes were unpacked, and the nursery was ready — three cribs, a changing table, nursing chair(s), and a closet full of baby clothes and blankets in an array of blues, greens, and pinks. I had just spent two weeks on spring break, and I was at work that morning getting my classroom and lessons ready for the following Monday. 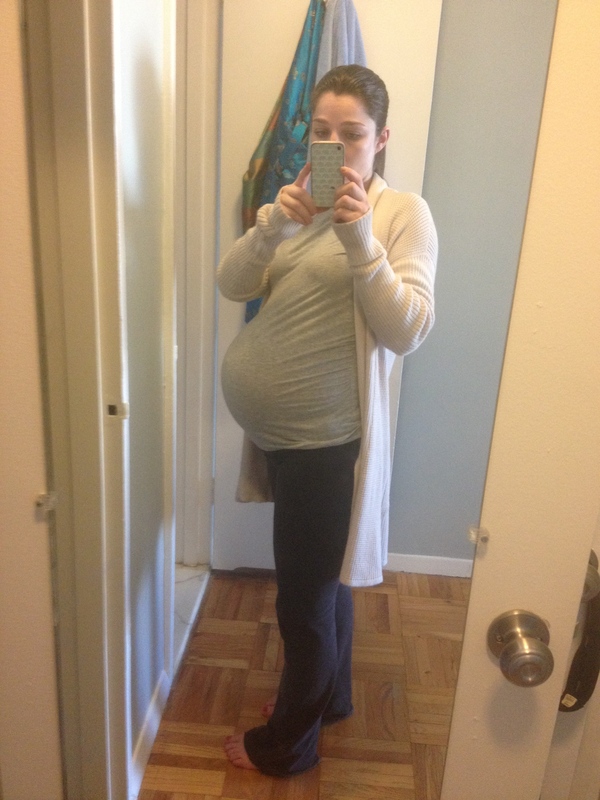 I went to Destination Maternity to get a few more items to help my ever-enlarging belly make it through the spring. We were ready. Except that we weren’t expecting these babies for another six or seven weeks. And you know what we hadn’t done? Packed a hospital bag. Our empty nursery. Ready for three. To be perfectly honest, I still think back to those last few days in March with an enormous mix of emotions, and often, guilt, regret, and sadness are at the top of the list. I know, I know, we have SO much to be thankful for. 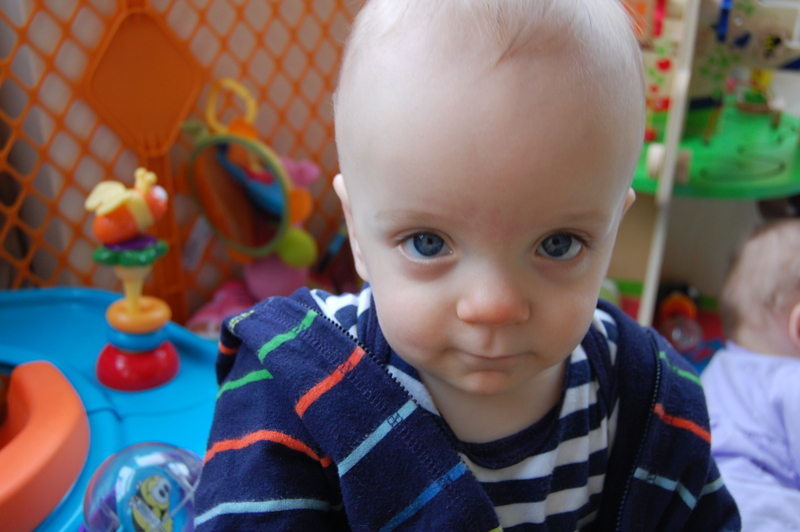 It all turned out pretty perfectly, and we have three healthy, happy, almost-one-year-olds at home with us now. I think it is hard to explain why I feel this way to someone who didn’t have a preemie (or three), but maybe I’m wrong. Maybe all first time mothers feel this way. But I still wonder–quite often–if I did something wrong. As a mother-to-be, we know our most important job is to keep our baby (or babies) healthy and growing until the day they are ready to meet the world. Well, Henry, Jack, and Sophie might just have had a different time table than the rest of us, but doctors can tell you that at 27 weeks and 1 day, babies are generally NOT ready to meet the world. Given the wonders of modern medicine, 80% of those 27-weekers survive (or so we were told on the night of March 28, 2014), but they aren’t supposed to be here that early. And before you say, “Oh, but triplets always come early!” know this: the average triplet pregnancy is 32 weeks long. So, a year later, I still wonder what might have happened if. If I could have kept these babies cooking a bit longer. If maybe I had just taken a cab instead of walking to the bus stop, they wouldn’t have been born so early. If I had spent the day with my feet up instead of lesson planning and maternity clothes shopping. If, if, if. Futile, I know. Irrelevant, I know. And with any luck, there will come a day not long from now when I stop wondering (or caring) whether things could have gone differently. But before I delve into the story of how Henry, Jack, and Sophie made their grand entrance, you should know, that April 2, 2014 is a difficult (and amazing) day to remember. While Will and I were settling in for the evening, I felt a twinge I hadn’t felt before. It wasn’t terribly painful, and it didn’t last long. But then I felt another one. And another one. Approximately three minutes apart. We called MFM (our high risk doctors) and they advised that we come to the hospital to have things checked out. Will and I remarked to each other that we hadn’t packed a hospital bag yet, but we reassured each other that we’d probably be coming home shortly. And I can’t speak for Will, but I know I really believed that. I think I’ve mentioned this before, but three days earlier, my fetal fibronectin test had been negative. That meant only a 1% chance I’d deliver within two weeks. I had math on my side! I was having contractions pretty close together, and they were apparently pretty big contractions, but at the start, they weren’t terribly painful. Will and I watched them on a screen next to my hospital bed. A Neonatologist came in to talk to us about what it would look like if I had the babies that night. Suddenly it started to feel like we might be needing that hospital bag. That’s when she gave us the “survival rate: 80%.” She said that’s what everyone wants to know. I did NOT want to know that. I started steroid shots in an effort to rapidly develop the babies’ lungs which were are not fully developed until 28 weeks. They tried to manage my contractions with magnesium. The contractions got increasingly painful. I had to keep four monitors strapped to my stomach (three of which had to keep being repositioned so they could monitor the heart beats of the three moving babies in my belly) continuously. I was in the hospital until Monday, March 31, when they discharged me. My doctor was at a conference in Vegas. When I was discharged, I was told I should take the rest of the week off and then could go back to work. I was told that nothing had changed. I was told I would continue feeling contractions because my body believed (rightfully so) that it was 40 weeks pregnant with one baby. And I was told I would not be having these babies any time soon. I believed everything they said, was THRILLED to be home and showered, and in my own bed. Except I couldn’t sleep. The contractions continued, getting more intense and closer together as the night progressed. I was told this might happen. At 11:50 pm, I started logging them, and in the meantime, I did everything I could to get comfortable. This went on (and I never did get comfortable) until 3:30am. By 3:30 am, I was certain I was going to have the babies. Even after the initial hospital stay, I think this was the first time I really felt like I might actually be having these babies, and I started to panic. “It’s too early,” I told Will. “They’re too little. They’re not ready.” Will was EXTREMELY calm. Those of you who know Will, know he is patient, cool, calm, and collected 95% of the time. Those of you who REALLY know Will know that he gets pretty flustered when things don’t go according to plan (he is a perpetual planner). And this was definitely NOT the plan. Will has since admitted that he felt as panicked as I, but thank goodness he had his game face on. Back to the hospital we went. They didn’t ever admit me. I spent 11 hours in triage. 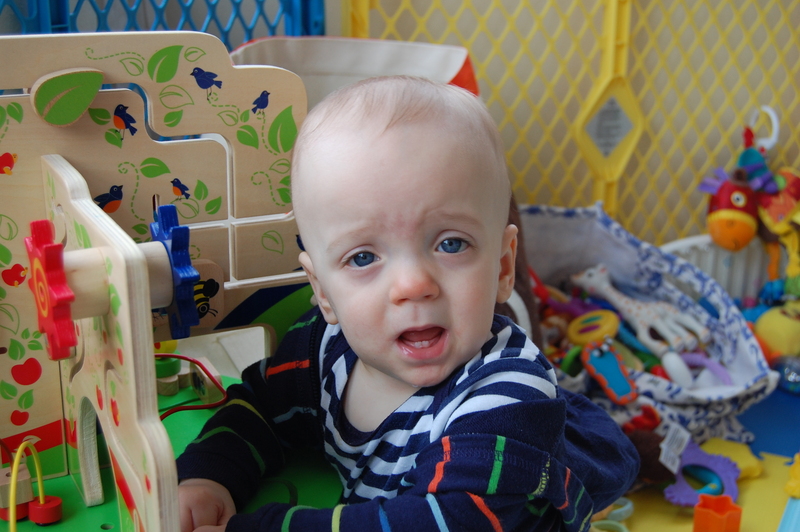 I was again hooked up to four monitors, continuously, and every time I, or the babies moved, they had to be repositioned. I continued to have contractions all day. They were definitely painful this time. I was told I couldn’t leave until I saw my doctor. My doctor was still in Vegas. I saw another doctor, except actually, I just saw the ultrasound tech. Everything measured the same as it had the day before, so the doctor said he didn’t need to see me. I stopped logging contractions at 7:30pm. I’d been having 3-5 per hour. I started logging contractions at home again, starting at 12:17am. By 12:38, I had logged six. 12:17, 12:25, 12:27, 12:32 “not as bad,” 12:34 “ditto,” 12:38 “painful,” 12:46 “pretty painful,” and so it went on. I again tried everything I could to get comfortable. Will and I tried to sleep. I tried to let Will sleep. The doctors had convinced me that I wasn’t having these babies. I didn’t tell Will. I thought, “I can tough it out. Nothing’s changed.” By 3am, I simply could not bear the pain any longer. I woke Will, and then thought, “Wait. Maybe I can still tough this out.” By 3:30, I knew I could not tough it out. If it wasn’t labor, fine. But I needed something to manage the contractions. Or help me sleep. Or both. We got in a cab again. Our doorman must have thought we were completely nutso by this point. I called my mom to see if she could meet me at the hospital since Will really needed to go to work. Doctor: So, we’re actually going to deliver. Where’s your husband? Doctor: We have some time. How far away is work? Doctor: He should get in a cab. And he did. And I was immediately prepped for a c-section, and by 5:15, Will and I were in the OR, getting ready to meet Jack, Henry, and Sophie. Along with a bazillion doctors. At 5:34, Jack was born. At 5:35, Henry was born. At 5:36, Sophie was born. I got a “kiss” from Jack, and said a quick hello to Henry and Sophie. Shortly thereafter our 2 pound bundles were whisked away to the NICU. And so Will and I got ready to divide and conquer. He went to Beth Israel with the babies, and I stayed at Mt. Sinai. His mom met him downtown, and mine stayed with me uptown. We’ve had a lot of practice dividing and conquering in the year since, and I imagine there will be many more opportunities for us to further develop that dynamic in the years to come. None quite as emotional as that first night, I hope, but whatever the rest of our lives bring, I feel pretty confident that we can tackle it together. Even if the children do outnumber us :). These babies are 11 (and a half) months already! And they won’t sit still for group photos. 5:00 to 6:00 am: The trio wakes up, one by one, always in a different order. 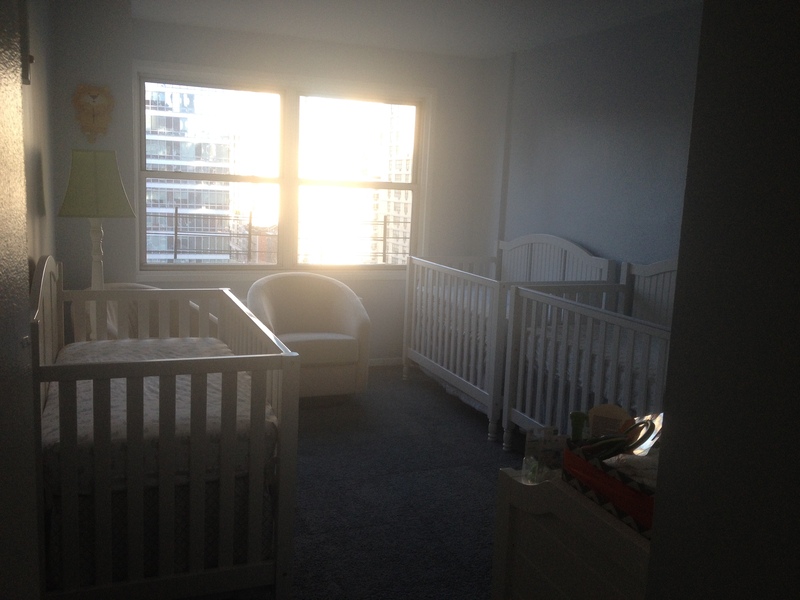 5:45 to 6:25: They chat in their cribs while Will and I get ready for the day. Sometimes this takes too long and they fall back to sleep. Oops. 6:30 to 7:00: Diapers changed, babies dressed for the day. Yes, this takes 30 minutes. These guys are wriggly little buggers! This is everybody’s preferred bottle position. One-handed for Sophie, completely vertical for H, and laid-back and relaxed for J. 7:15 to 8:15: Play time! Because sometimes, even though we have an entire playmat, it feels like the thing to do is pile up on top of one another in one corner. Standing is more fun with three! 9:00 to 10/10:30: Morning nap. I use the word “nap” loosely here, since a good 30-45 minutes of this is more chatting in the cribs, banging their feet against the walls, or standing up and (sometimes) forgetting how to get back down. 12:00 to 1:00: More play time! 1:30 to 3:00: Afternoon nap. Same routine as before. A little bit of napping, a little bit of chatting. 3:00 to 4:50: Playing! Again! 4:50: Dinner and milk in high chairs (pasta w/meat sauce, fish, turkey soup w/rice). 5:30: Pajamas on (baths on bath day). This is particularly difficult. It works best in a sneak attack. Change one baby when he or she least expects it. Then, as soon as you think they’ve forgotten, change the next. Repeat. 6:00: Bedtime begins, and it’s difficult to say exactly what it will look like, although it will almost certainly involve some (perhaps a lot) of crying, a song (or two or three), a good amount of whining, a lot of rocking on hands and knees in the crib, and one really fast bolt to the nursery door by two (sometimes one) not-so-stealthy parents. STANDING. Everybody is standing. 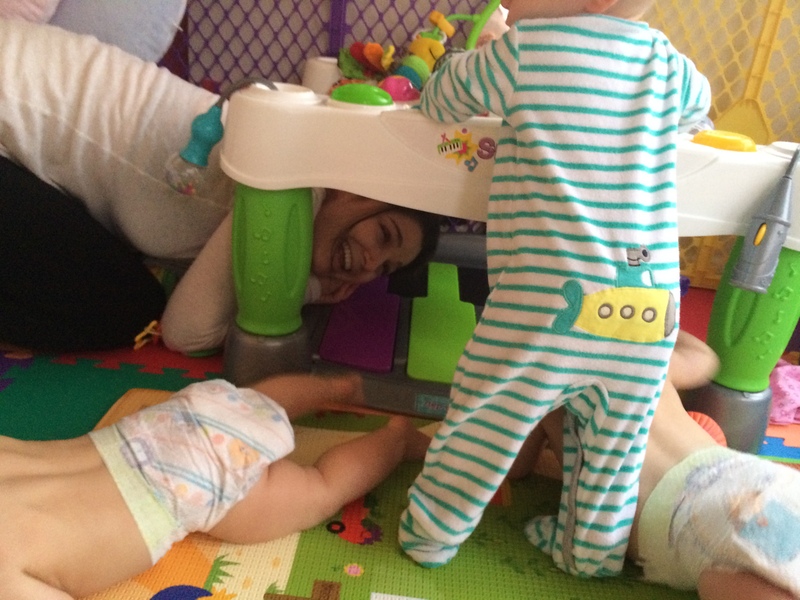 At their exersaucer, the door to the baby jail, in their cribs, hanging onto our shoulders. It’s pretty much their favorite thing to do. Until Sophie forgets how to get down. But she’s working on that too. See those teeny tiny tops of heads? That’s usually what I see when I leave in the morning. Sophie’s friend Emi taught her how to use the walker. ROAMING. They are exploring other parts of the apartment. Time to baby proof! NO MORE PREVACID! And, this is the best part, drum roll please….NO MORE REFLUX! Weight: 16 lbs something. I forgot to remember at our last doctor’s visit. Clothing size: We’re finally graduating to 6-9 months, although this little lad still rocks the 3-6 month size too. Favorite foods: puffs, pasta with meat sauce, fish sticks! Favorite toys: Books, ladybug stuffed animal, Tree Top Adventure, snack cups, diapers! 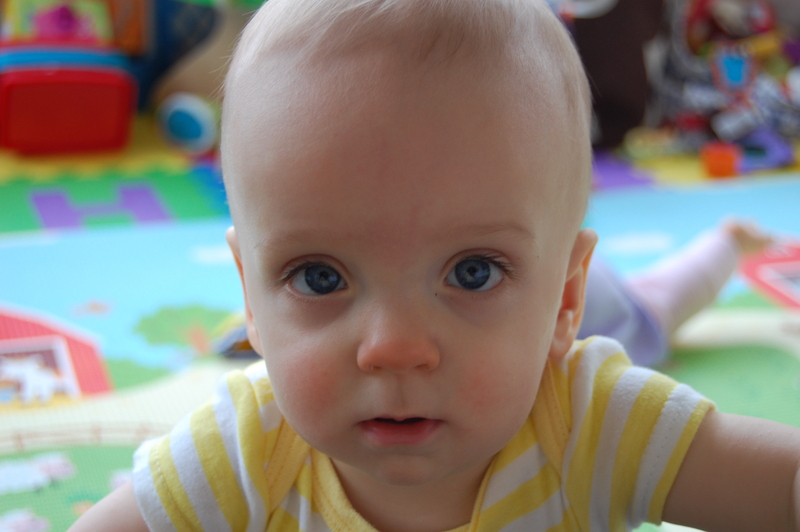 Favorite Pastimes: tackling (hugging) sister Sophie, reading, eating, dancing, singing, climbing all over Mom and Dad. Sounds: Ba-ba, ma-ma, da-da, ga-ga, and other assorted babbles. Things we are working on: Jack is our master crawler. He’s also been the first to catch on to standing up one foot at a time. He’s working on using a snack cup (reaching in and pulling out a puff), drinking from a cup, and cruising. Weight: 17 lbs something. We forgot his too. Clothing size: Same as his brother. Are you surprised? Favorite foods: It’s hard to narrow down the list, but puffs, meat sauce, and waffles are high on the list. Oh, and broccoli or spinach pancakes. And fish sticks! Least favorite food: Haven’t found it yet! Favorite Pastimes: eating, bouncing on his ball, taking a bath, climbing up our backs, and looking down our shirts! Things we are working on: Creeping on his hands and knees. When he feels the need for speed, Henry prefers the army crawl. He also only seems to creep on padded surfaces. We are also working on drinking from a cup, using one foot to stand up, and cruising. 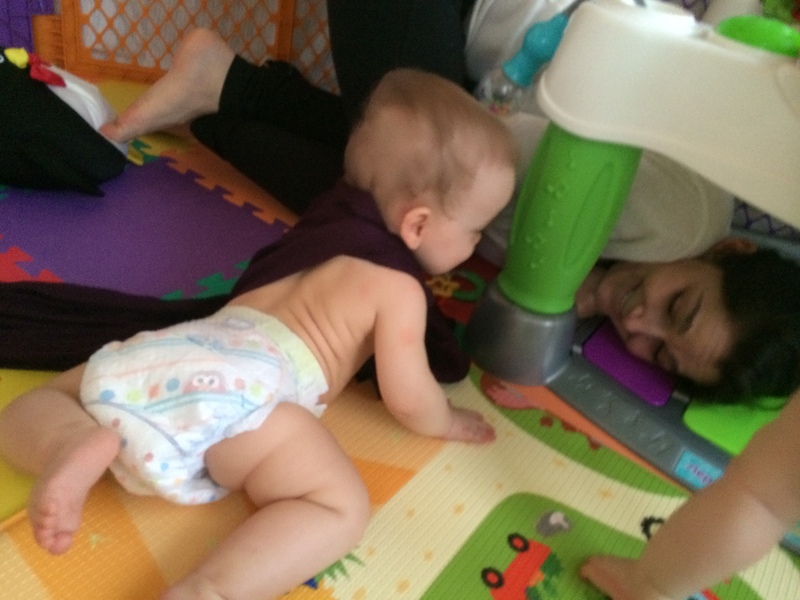 It’d be nice if he stopped flipping over on the changing table too, but I think we’ll choose our battles. Clothing size: this teeny peanut is still hanging out in her 3-month clothes from Carter’s, but she’s making her way into 3-6 month clothes more and more. Favorite foods: puffs, yogurt smoothies, waffles, turkey, FISH STICKS! 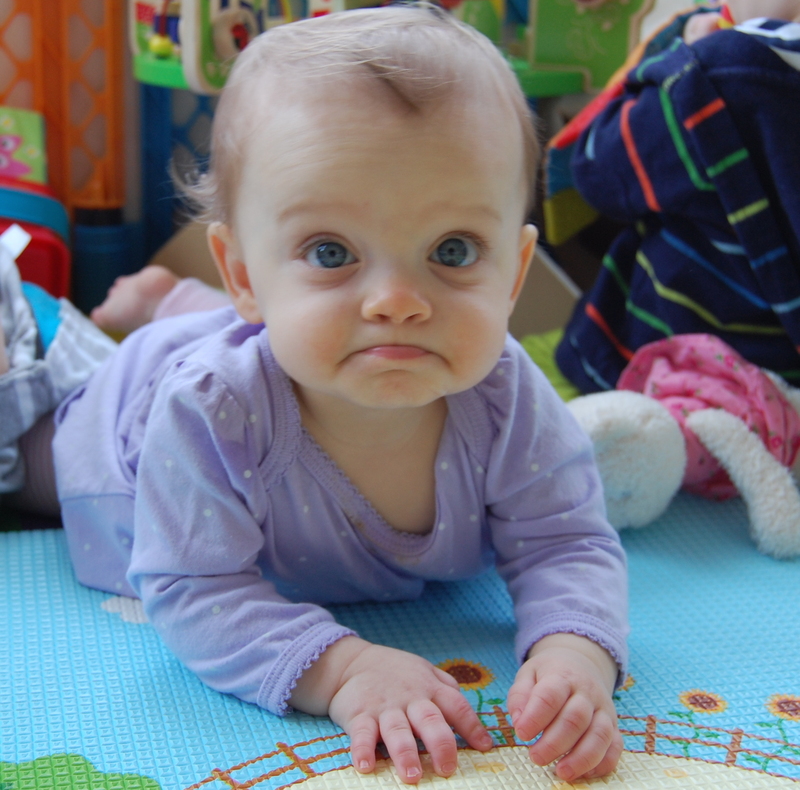 Things we are working on: reciprocal crawling. Sophie prefers to reach with her right arm and pull with her left arm, dragging her right leg behind. She’s very efficient, if a bit awkward! We are also working on getting down from standing (I think short arms are a factor here! ), eating more finger foods, drinking from a cup (we have a LONG way to go here), and clapping. Sounds: Ba-ba, ma-ma, da-da, ga-ga, ya-ya, ay-yay and other assorted babbles. *By the time I posted this, Sophie had cut those two little teeth we were all anticipating. We’re hopeful her adult teeth know something her baby teeth don’t, because these two teeth are DEFINITELY not where they’re supposed to be! Braces times three? Ouch. Mostly these days there’s a lot of standing up, chatting, laughing, crying, taking each other’s things, roaming around on the floor, chewing on things, and being adorable. Next up? Turning one! Posted in Feeding, Firsts!, Milestones, Progress! Having triplets is hard. There. I said it. I think maybe for the first time in eleven months. I don’t know if that means it’s getting harder, or if it is all finally catching up with me, but these last few weeks have been EX.HAUST.ING. See? I’m taking TOTAL liberty with capitalization AND punctuation. I MUST be tired. And I’ll let you in on another secret. All three sleep through the night. And have for months. I know, I know. We are SO lucky. It could be SO much harder. I didn’t sleep through the night myself until just recently (probably the result of the aforementioned exhaustion), so I get it. 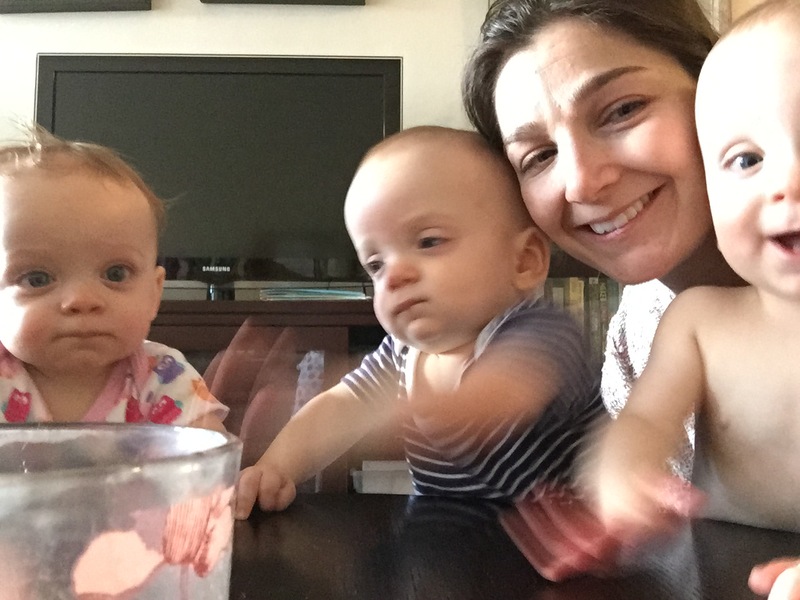 When I admit to people that our trio sleeps through the night–it is always the second or third question people ask, after “How are you doing?” and “How are the babies?”–some (most) of those people seem to imply that things must be pretty easy then. Well, I’ve got news for you. 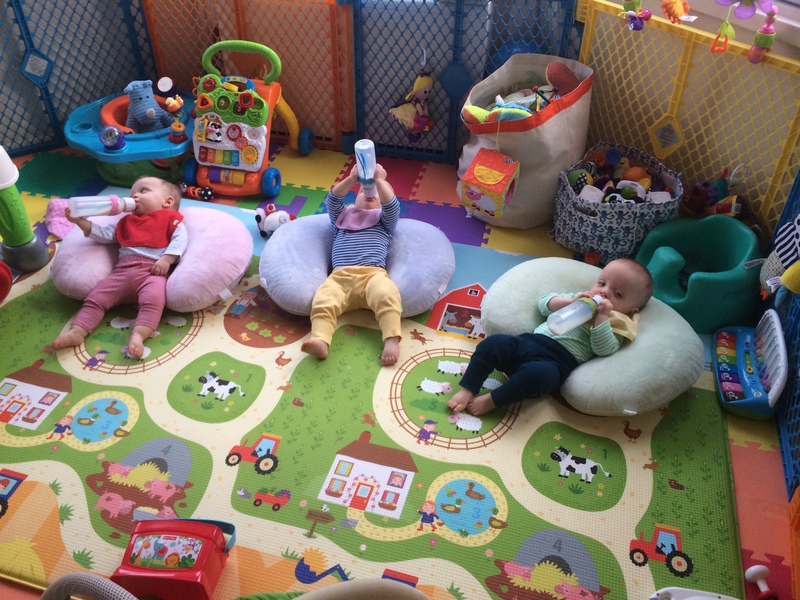 Even though they sleep for a good portion of every 24-hour period, and even though they are completely adorable, these silly little triplets are hard work. Us? Hard work? But we’re so cute! If you look closely, you might notice that not one of these children is holding his or her own bottle. Not one. Get it together, will ya, Mom? But luckily, amidst all the chaos, the unknowns, and the unfinished work, these three little people are growing more adorable by the minute. 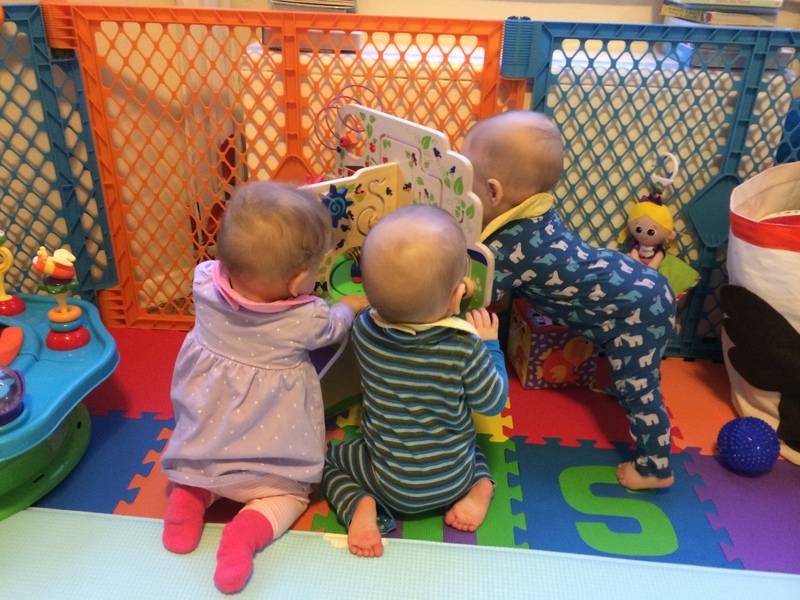 So while it didn’t feel appropriate to hashtag about the trials and tribulations of life with triplets while celebrating their eleven month milestone (a week late), I thought I should at least explain a little bit of why I am late on this post. And you know what? 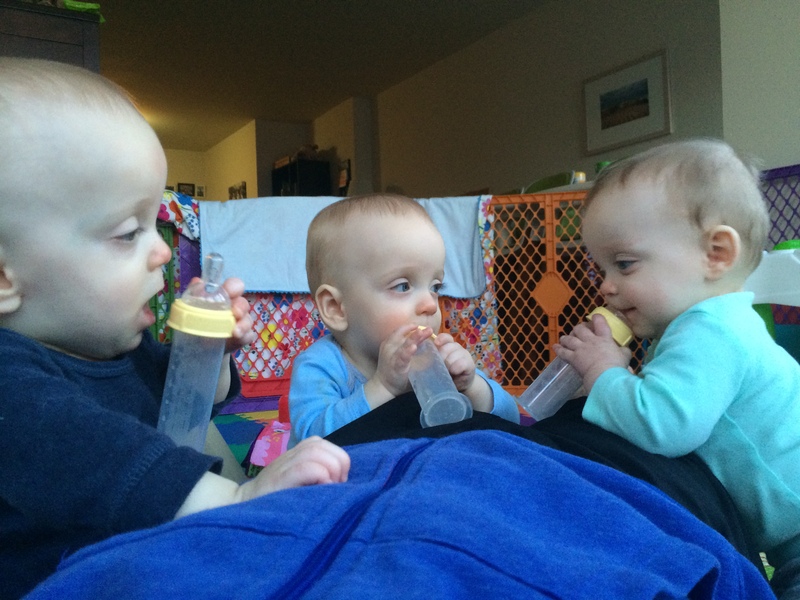 It felt good to finally say (write) out loud (on the internet) that having triplets is hard. But when it’s fun? It’s REALLY fun. What are you doing down here, Mom? Three times as much fun. Eleven month stats coming soon.